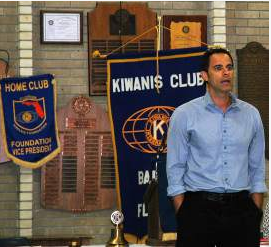 Dr. Alain Delgado, a neurologist with Neurology and Neurosurgery, with offices in Lakeland and Winter Haven, addresses members and guests at the July 24 meeting of the Bartow Kiwanis Club. Multiple Sclerosis. Briefly, it is a disease in which the body’s immune system attacks the central nervous system (brain, spinal cord and optic nerves). One of those who has been dealing with MS is Kiwanis member Mary Beth Packard, who has been getting treatment for it the past 25 years, and it was she who introduced the guest speaker at the Friday, July 24 Bartow Kiwanis Club meeting, Dr. Alain Delgado. According to Delgado, between 2 to 2 1/2 million people worldwide have been diagnosed with multiple sclerosis, with approximately 400,000 of them in the U.S.; and that 100,000 new cases are diagnosed each year. MS, said Delgado, is an autoimmune disorder. To better explain the condition, he likened it to a sometimes all too familiar occurrence. “It’s a matter of mistaken identity,” said Delgado. The autoimmune system makes an error and begins to attack healthy cells. It can begin as early as age 2 and as late as age 75, he said, and the symptoms might not manifest themselves for a number of years. Among the symptoms are loss of vision, weakness, numbness and balance. As recent as 16 years ago there were no known treatments, he said. Today there are 20 of them. However, there still is no cure and the best one can hope for is controlling the symptoms. However, like many medications, there are side effects, which Delgado did not detail. Another challenge is the cost. As an example, he said that one prescription runs approximately $60,000 annually; often a person diagnosed with MS is on more than one medication to control the disease. Being diagnosed also shortens many lives, as much as seven years in comparison to the general population. However, due to the medications now on the market, the life expectancy has been lengthened, so while living, on average, is seven years shorter, life expectancy used to be much shorter. What causes MS is still not determined. While some of it is believed to probably be genetic, it is speculated and being researched what role, if any, environment might have, as well as that of nutrition. Scientists are looking into a potential link between the condition and vitamin D deficiency. However, MS is not the only disease or condition Delgado treats. Another is Alzheimer’s disease. Symptoms can take as many as 20 years before it is noticed. The disease is on the rise. One reason for that, according to Delgado, is that people are living longer. Also, thanks to the baby boom that followed World War II, the population exploded exponentially. To combat Alzheimer’s, as well as dementia, eating healthier and exercising are steps people can take. It is no guarantee, but it may stave off the disease and its symptoms.